A very minimal show on Donald Judd at David Zwirner, London until 19th September. I've always been interested in Donald Judd and his approach to sculpture via painting, I wish there were more of his early paintings around that show his transition into his minimalist sculptures. The Tate show a few years ago must have been one of the biggest shows of his work in London and was excellent..
Photo by Richard Einzig, Brechten-Einzig Ltd.
New York, NY. Photo by Alex Delfanne. 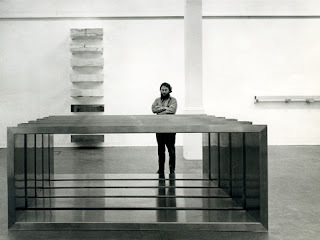 Press details: This is the first gallery presentation of this seminal artist in London in nearly fifteen years and the first significant exhibition of Judd’s work in the U.K. since his 2004 retrospective at Tate Modern, London. From the early 1960s up until the time of his death, Judd developed a rigorous visual vocabulary that sought clear and definite objects as its primary mode of articulation. Together, the works in this exhibition present an overview of many of Judd’s signature forms and offer insight into his singular commitment to material, colour, and proportion. One of the most significant American artists of the post-war period, Judd’s oeuvre has come to define what has been referred to as Minimalist art — a label to which the artist strongly objected on the grounds of its generality. The work of Donald Judd is included in numerous museum collections. Permanent installations of the artist’s work can be found at Judd Foundation spaces in New York City, at 101 Spring Street (following extensive restorations, his home and studio opened to the public in June 2013) and Marfa, Texas, along with the neighboring Chinati Foundation. Judd Foundation (Rainer Judd and Flavin Judd, Co-Presidents) is exclusively represented by David Zwirner. 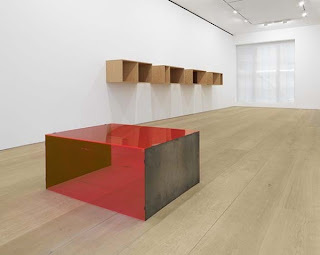 In 2011, the gallery exhibited a selection of works by the artist drawn from his seminal 1989 exhibition held at the Kunsthalle Baden-Baden, Germany and in 2013 a major installation by Judd was included in Dan Flavin and Donald Judd, the inaugural exhibition at David Zwirner’s new 20th Street location in New York. Judd’s work is currently on view in the exhibition Donald Judd: The Multi-Colored Works at the Pulitzer Foundation for the Arts in St. Louis (through January 4, 2014).